Back in 1992, when I was working at a British sailing magazine, I volunteered for some tough duty—covering the first International Festival of Sail in Brest, France. Someone had to do it, and as a wooden-boat owner, I was the magazine’s de facto classic boat expert. I was no stranger to boat shows, regattas and classic-boat festivals. I was not, however, prepared for what I found in this famous Breton port. The French navy’s docks in the Penfeld River were opened up to public use for the first time ever, and they were crammed with hundreds of traditional boats whose variety defied description. They had come from all corners of the North Atlantic and the Mediterranean, from all the Scandinavian countries, from Canada and the United States, from South America and Africa. There was a fleet of tall ships the equal of any I’d seen, countless wooden cruising boats that had been lovingly spiffed up for the occasion, and dozens of rebuilt, restored and recreated working craft from every region of the French and British coasts, and a few more besides. The historic Rade de Brest roadstead was alive with red, tan, cream and white sails sported by boats of all sizes, from tiny dinghies to majestic square-riggers, more than 2,000 boats all up—it’s safe to say the world had not seen its like. Many voyagers had covered serious miles to get there. I met up with legendary author and SAIL contributor Don Street, who, together with one of his sons, had sailed a flimsy wooden Dragon raceboat from Ireland across the Irish Sea and the Western Approaches, both notoriously ill-tempered stretches of water fringed by unforgiving coastlines. The ensigns of other boats told similar stories: Danish, Dutch, Finnish, Welsh, Scottish and German colors snapped in the fresh breeze alongside the hundreds of tricolors. Shoreside, the scene was just as amazing; I heard later that close to a million visitors had thronged the port and the town during the week. There were demonstrations of all sorts of seamanlike things, from traditional ropemaking to clinker-building boats. Troupes of musicians from all over Europe broke into song and dance wherever they found room. Long tables sagged under the weight of trays of langoustines and beer. The buzz of the crowd and the caterwauling of Breton and Irish bagpipes continued into the small hours, punctuated by firework displays and incredibly loud shots from an 18th century ship’s cannon gleefully deployed by a group of smoke-stained Napoleonic War recreators. The bars stayed open until—well, they just seemed to stay open. In short, it was one hell of a party. Since then, the festival has been held every four years, almost like an Olympics for classic boats. 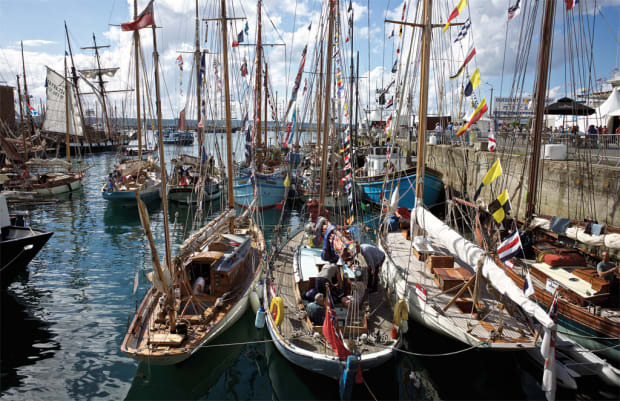 There are other big classic-boat events in Europe—the biennial event at Douarnenez, just around the corner from Brest, is justly popular—but none have the cachet of Brest. This year’s maritime festival, the seventh, got under way on July 13. 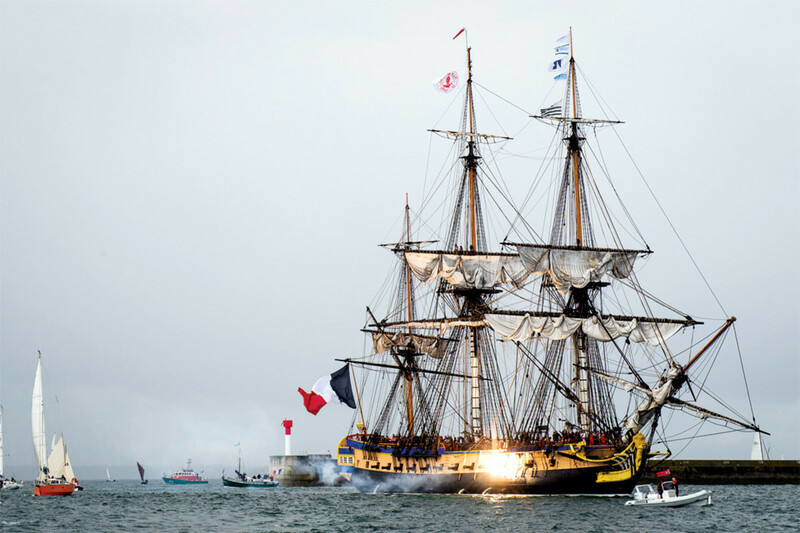 The star this time around was the lovingly built replica of L’Hermione, the frigate that carried the Marquis de Lafayette to America in 1780. As her crew swarmed aloft to furl her sails she glided majestically into the harbor, sounding a 21-gun salute to officially open the festival and unleash another week of partying, proving once again, if proof were needed, that no one loves boats, sailing and the culture of the sea as much as the French.